Laminitis (founder), as defined by the UC Davis Book of Horses, is “inflammation of the laminae of the foot which serve to attach the coffin bone to the hoof wall.” It is caused by an interruption (constant, intermittent or short-term) of blood flow to the sensitive and insensitive laminae. Weakening and disconcerting the bond between the coffin bone and hoof wall, the effect of inflammation in the laminae is often permanent. The condition dubbed “chronic laminitis” involve cases which last more than 48 hours, and is more severe than those treated immediately. Prolonged cases of laminitis are also referred to as founder, although most people use these terms interchangeably. In the more severe cases of this condition, the coffin bone may actually separate from the hoof wall, and in turn can cause the coffin bone to rotate within the foot and sink downward towards the sole. If the condition is allowed long enough without proper treatment, the coffin bone can actually penetrate the sole causing unthinkable pain, and for humane reasons these horses are often euthanized. This irreparable foot condition has a number of causes, usually from disturbances elsewhere within the horse’s body, most of which are easily prevented with proper management. Sadly, it is often caused by people “loving their horses to death.” The majority of reasons for it seem to be that like their human caretakers, horses live in greater numbers within smaller spaces, doing less work and eating richer meals than their previous generations. Digestive upsets, due to excess grain in the diet or sudden changes in feed, and excessive amounts of lush (usually spring) grass suddenly introduced into the horse’s grazing are causes. The latter is often referred to as grass founder. More dietary causes include consumption of cold water before proper cooling out of a hot horse, and can include incidents when your horse breaks into the feed room, consuming a large amount of grain. In this situation, call your vet immediately. To wait for symptoms to develop is to unnecessarily put your horse at risk, and be too late to prevent it. Healthwise, high fevers or illnesses as well as those that cause serious metabolic disturbances, including Potomac Horse Fever, severe dehydration, and severe colic all put your horse at risk. Sometimes, even trying to treat health problems causes them. High doses of corticosteroids and prolonged use of them can put your horse at risk. Consult your veterinarian for proper dosaging and be informed of the risks so that you can prevent them. Mares who retain the placenta post-partum are at risk of developing laminitis as well as metritis due to the fact that the placenta is attached to almost the entirety of the uterine wall with the potential to cause infection and scarring (scarring also limits the attachment for the next placenta, potentially causing death for the fetus). “Road founder” is caused by excessive concussion on the horses feet, usually from riding on the road or other hard surface, or by a horse escaping his stall and frolicking in the parking lot. Excessive weight-bearing on one limb, including when a horse is favouring a leg after an injury, or alterations in the horse’s normal gait put your horse at risk. If you notice this habit developing, seek help from the experts to correct it. Overweight horses and those on carbohydrate-rich meals are especially at risk in these situations; as are heavy horses and ponies. Some sources suggest that certain breeds are more prone to laminitis. Although reasons aren’t known definitively, black walnut shavings in bedding can cause laminitis. It is recommended that you never purchase bedding containing this type of wood for use on horses. Saving a few bucks at the time, if that’s the case, may cause severe cases of laminitis potentially damaging the horses’ usability for the rest of their lives if not managed. Once a horse has laminitis once, it puts him at risk of redeveloping the inflammation again, further damaging the health of the foot. Also, elderly horses with Cushing’s disease are at risk for developing laminitis. If caught early enough, most horses can resume their normal lives and continue to perform well. Horses with highest hopes for future success are those with less than 5 – 10 degrees of rotation of the coffin bone this usually includes the horses with laminitis detected early and treated immediately. Horses with coffin bone rotation greater than 10 degrees are more likely to have less ability in athletic endeavours later in life. For the horses that suffer chronic laminitis and in severe conditions, there is little than can be done to “cure” them. These horses suffer from irreparable damage, and are often euthanized for moral reasons. Laminitic horses usually have increased heart and respiratory rates, and a heightened temperature. These signs, however, can be mistaken for a number of other things, so the signs of acute and chronic laminitis are further described below. Acute laminitis can be suspected when lameness is evident when the horse is turning in circles, and in some cases shown by shifting lameness while standing. The horse will also have heat in the affected foot (or feet), accompanied by an increased digital pulse (can be felt at the back of the pastern). The horse will also show signs of pain in the toe area, especially with pressure applied with hoof-testers. He will also likely stand with his forefeet outstretched and his hind feet positioned to bear more weight (if it is his front feet that are affected), and will be reluctant to move from this position. On top of the previously mentioned symptoms, chronic laminitis (long-term, also known as founder) displays signs such as rings in the hoof wall that become wider from toe to heel, and are accompanied with bruised soles or “stone bruises” with flattened feet (dropped soles). 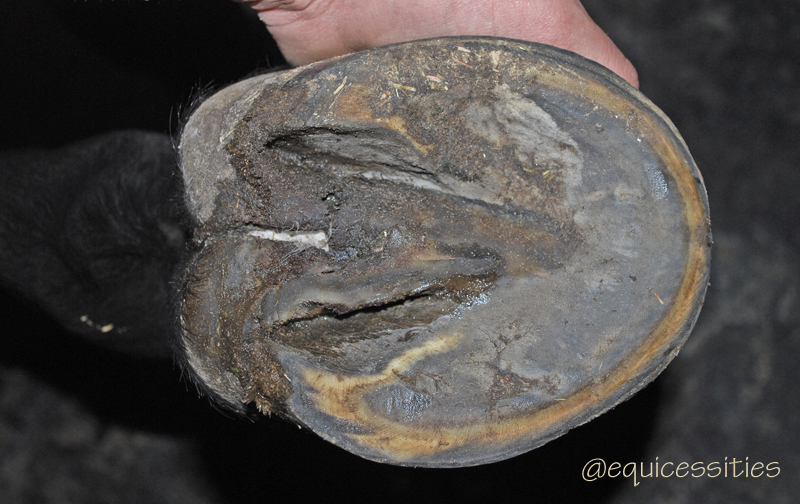 These horses also have a widened white line (seedy toe) with presence of seromas (blood pockets) and/or abscesses. Horses with chronic laminitis have a tendency to have unequal hoof growth. The hoof grows faster at the heel, assumed to be the horse’s natural response to relieve the pressure on the toe, resulting in a dished hoof – looking similar to an “Aladdin-slipper.” It is often best to trim the heel down and use supportive shoeing. Prevention is better than the cure when it comes to laminitis. Once the coffin bone begins to rotate from the weakened laminae, there is little an owner can do to actually fix it. But this is where science has come through within the last several years. We now know that fructan, a sugar found in many pasture grasses, can cause laminitis, thereby making us aware to take precautions once winter passes. Equipping your horse with a grazing muzzle, or introducing pasture-turnout gradually can prevent him from gorging on the pasture, and mowing the grass after rainfall can keep the consumption of the rich grasses lowered. If a horse’s regular exercise decreases because the owner grows increasingly preoccupied with work/family/etc, it is essential to decrease the concentrated ration when the horse’s workload decreases. Educated barn managers should appropriately adjust the feed gradually to accommodate for the lessened exercise routine, or owners should consult books or their veterinarian for advice on the matter. A study performed in December of 2003 to reduce carbohydrates in hay (especially for obese, laminitic and insulin-resistant horses) was tested by soaking hay to dissolve the water-soluble carbohydrates (WSC). Not all hay is safe for horses suffering from the previously mentioned conditions. To speak generally on the matter, soaking hay in hot water for thirty minutes dissolved 29% of WSC, almost as much as soaking hay in cold water for an hour (resulting at absorption of 30.7% of WSC). This study shows that by soaking high-fructan hay, you are protecting horses from the risks of laminitis. Of course, you also decrease the levels of water-soluble nutrients and minerals your horse needs, but they can supplemented as necessary. (For further information regarding this study, see article #4777 at www.TheHorse.com) The best way to prevent laminitis is to manage everything within your control the best you can. Despite that there are several cases where there is almost nothing that can be done to cure the severe cases, proper management and treatment can make the road to recovery relatively simple for those detected early. Most cases of laminitis become chronic because of the rotation of the coffin bone and the weakened laminae, increasing susceptibility later on. When signs of laminitis are first detected, or your horse ransacked the feed room, it is a medical emergency. Do not hesitate to call you veterinarian. Get help before signs appear whenever possible. The sooner you begin treatment, the better your chances are for a more successful recovery. To alleviate the pain during the onslaught, cold hosing, or asking your horse to stand in buckets of cold water (on a cushioned surface, if possible) are often very helpful. Bute can also be administered to relieve swelling, and poulticing is often practiced to draw the heat out of the affected feet, making it more comfortable for the horse. If the onslaught of laminitis was caused by excess grain or grain overload in an overweight horse, a properly managed diet of adequate nutrition supplied in high-quality forage, oil, and digestible fibre (such as beet pulp) is an excellent way to manage. Avoid excess energy, particularly from grain, as this can contribute to another occurrence. However, these management tactics should not necessarily be excluded if there was another cause. Keeping the hoof growth healthy and properly trimmed is a must. Your veterinarian and farrier should be working together, whether in person, or through the “informed” you. Knowing the degree of coffin bone rotation, if any, which can be determined by X rays or radiographs performed by your vet, should be made aware to your farrier so that proper shoeing is ensured. The hooves should be trimmed regularly and if necessary, therapeutic shoeing kept up-to-date (monitor progress with radiographs if further rotation is expected, or to monitor stability of condition). Providing a nutritional supplement to promote hoof growth can be fed to the athlete, or for more serious cases even the pleasure horse – to ensure good, healthy hoof. Try to avoid allowance of your horse grazing on lush pastures. If necessary, keep pasture mowed after rainfall and equip your horse with a grazing muzzle to help prevent intake of fructan sugars in the grass. Another preventative measure of fructan in the diet is to avoid turning your horse out on green pasture between late morning and late afternoon. Also, soaking hay for 30-60 minutes (60 with cold water, 30 minutes with hot) to dissolve the water-soluble carbohydrates that can lead to laminitis. Dissolved nutrients can be supplemented into the ration as necessary. Your horse should also be kept on a regular worming and vaccination schedule as recommended by your vet to help ensure better health, and increased resistance to illnesses and disease. Your vet will play an important role on the path to recovery, and s/he can provide helpful insight and management advice for the individual horse. There have been cases where horses were treated by having the hoof walls surgically removed and the horse hung in a sling. The horse was then exercised in a rehabilitation pool during recovery in an animal hospital. This is often beyond the affordability to most horse owners, but evidence that there is always hope.